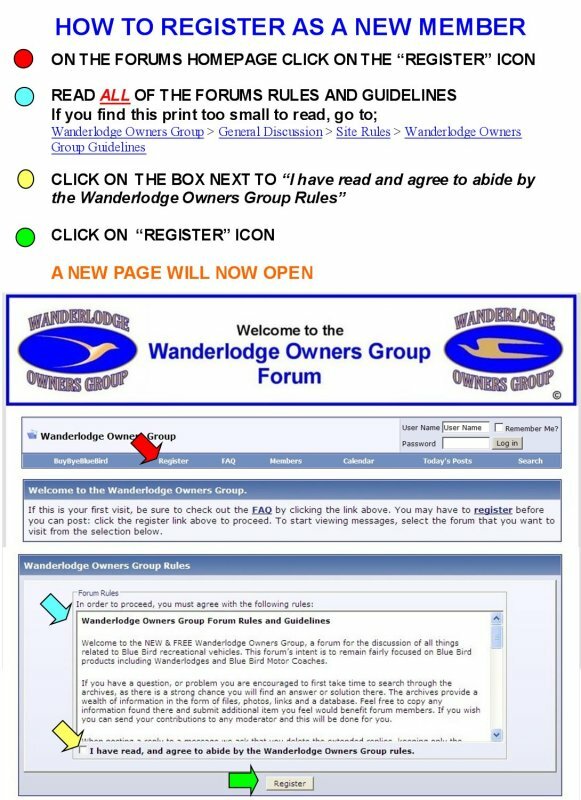 How do I Register as a New Member of the Forum and Log On To the Forum? Later in the registration process you will be able to hide your date of Birth from all members except for the Administrators. Click on "Proceed" to open the next page. THIS NEXT SECTION IS WHERE YOU WILL SET YOUR USER NAME, PASSWORD AND THE EMAIL ADDRESS THAT YOU CHOOSE TO REGISTER WITH. 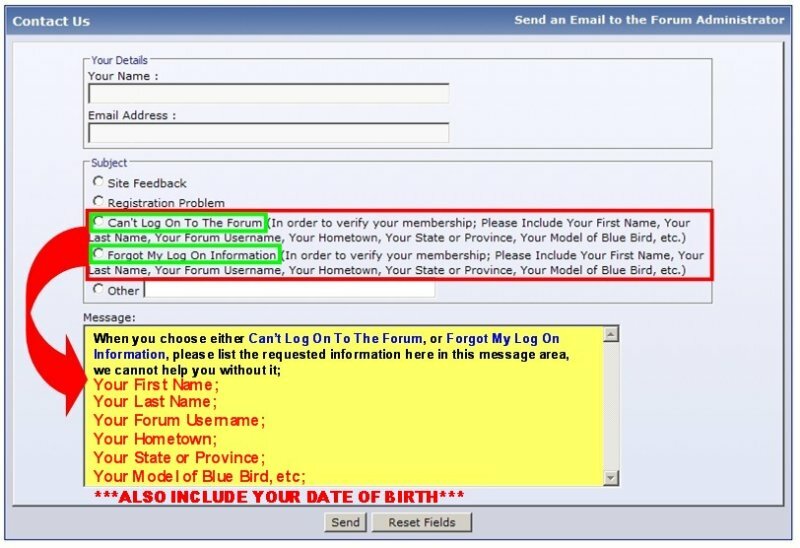 IT IS VERY IMPORTANT THAT YOU STORE A COPY OF THIS INFORMATION EXACTLY AS YOU ENTER IT, AS THIS IS HOW YOU WILL HAVE TO LOG IN TO THE FORUM AND IT IS CASE SENSITIVE. IF YOU FORGET YOUR PASSWORD AND THEN USE THE FORUMS SOFTWARE TO RETRIEVE YOUR PASSWORD, THIS IS THE INFORMATION THAT YOU WILL NEED TO ENTER TO DO THAT. THE PASSWORD ONCE IT IS ENTERED BECOMES ENCRYPTED BY THE FORUMS SOFTWARE THUS MAKING IT INVISIBLE TO THE ADMINISTRATORS, SO IF YOU LOOSE IT AND CANNOT REMEMBER THE USER NAME AND REGISTERED EMAIL ADDRESS, THAT MEANS IT WILL HAVE TO BE RESET TO A NEW ONE, BY ONE OF THE ADMINISTRATORS. WE USE AN IMAGE VERIFICATION SYSTEM TO HELP PREVENT SPAMMERS FROM REGISTERING ON THE FORUM, IT IS BACKED UP BY A PERSONAL VERIFICATION BY AN ADMINISTRATOR, BEFORE YOUR MEMBERSHIP IS FINALLY APPROVED. 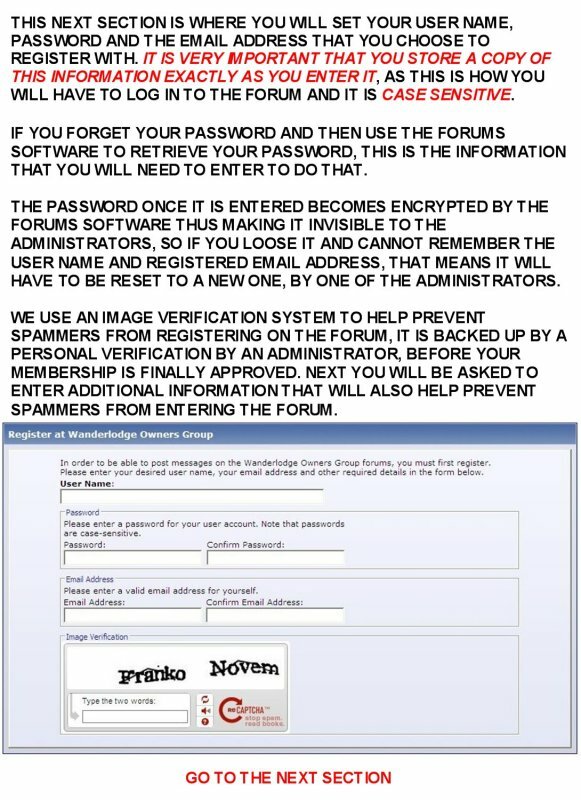 NEXT YOU WILL BE ASKED TO ENTER ADDITIONAL INFORMATION THAT WILL ALSO HELP PREVENT SPAMMERS FROM ENTERING THE FORUM. WE VERY SELDOM SEND OUT ADMINISTRATIVE EMAILS, BUT IF YOU CHOOSE TO NOT RECEIVE EMAILS FROM THE ADMINISTRATORS, YOU WILL NOT RECEIVE ANY OF THE NOTICES ABOUT ANY CHANGES THAT ARE MADE ON THE FORUM. CHOOSING THE CORRECT TIME ZONE FOR WHERE YOU LIVE, ENTERING WHERE YOU LIVE AND THE MODEL OF BLUEBIRD THAT YOU OWN, YOU CAN ALSO ENTER S.0.B. 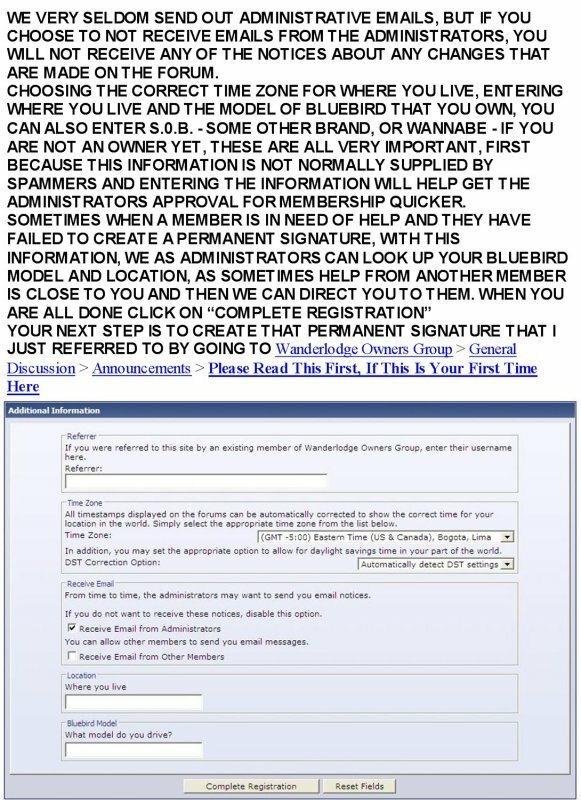 - SOME OTHER BRAND, OR WANNABE - IF YOU ARE NOT AN OWNER YET, THESE ARE ALL VERY IMPORTANT, FIRST BECAUSE THIS INFORMATION IS NOT NORMALLY SUPPLIED BY SPAMMERS AND ENTERING THE INFORMATION WILL HELP GET THE ADMINISTRATORS APPROVAL FOR MEMBERSHIP QUICKER. After registering as a member and receiving the approval email, enter your USERNAME and PASSWORD here, then click on Log in. Choosing Remember Me will activate your Cookies so you won’t have to Log in every time.